Cook a dish and a soup at one go with Song-Cho Rice Cooker (SC-FD18F2)! Add all of the soup ingredients into SC-FD18F2 rice cooker (except the seasoning). Close the lid and press MENU to SOUP, press START (hold for 2 seconds). While the soup is cooking, prepare the fish. Sprinkle black beans, ginger strips, chilli strips onto the fish (skin face down) and drizzle some oil. About 20 minutes into cooking the soup, open the lid, place a steamer onto the inner pot. Place the plated fish onto the steamer and close the lid, continue to let it cook till program completes. 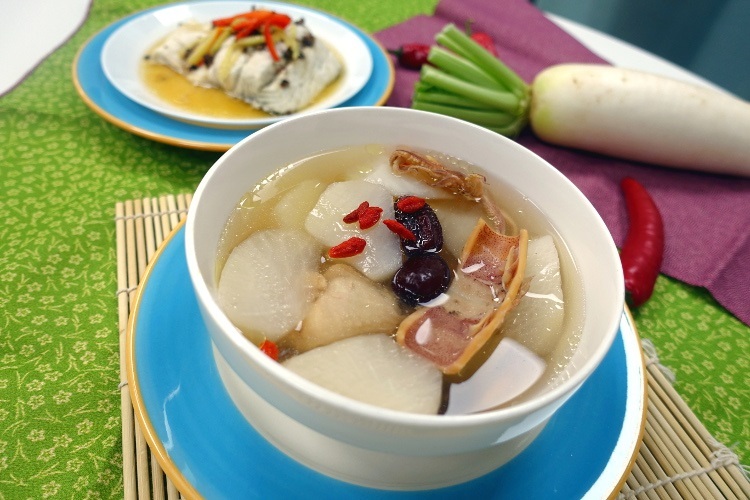 Remove the fish and steamer, season the soup with salt and chicken powder. Enjoy the dishes while they are hot. 关盖, 按MENU 键至SOUP功能, 按 START 键 (久按2秒).